The ACL is an elastic band of tissue in the knee that helps hold the joint together. An ACL tear is a common injury that can occur when the knee is twisted or hyperextended. Often the injury occurs as a non-contact pivoting injury. 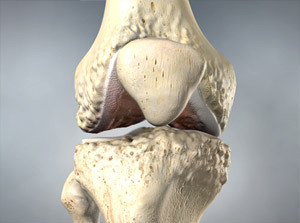 An audible “pop” is commonly appreciated, and the knee immediately begins to swell. For reasons that are not fully understood, ACL tears are much more common in women than in men. When compared to males, the bony area that contains the ACL is more restrictive. Female ACL’s are smaller than male’s. Women also have slightly increased knee joint laxity, and land differently from a jump because of their unique bony alignment. ACL tears can occur in association with other injuries such as meniscal and ligament tears. 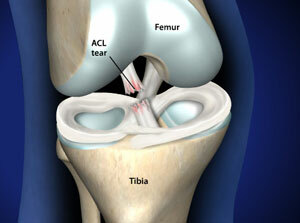 Isolated ACL tears result in knee instability. This means the patient feels the knee give way. A feeling of mistrust usually occurs with twisting, pivoting, or changing direction. The lower leg becomes unstable in its relation to the upper leg. Female athletes who participate in jumping and pivoting sports are 2 to 10 times more likely to sustain a knee ligament injury, such as an anterior cruciate ligament (ACL) injury, than male athletes participating in the same sports. The substantial increase in the number of women and girls participating in athletics, coupled with the 2- to 10-fold higher injury rate, widened the gender gap in the number of serious knee ligament injuries. Most ACL injuries—whether in male or female athletes—occur by noncontact mechanisms, often during landing from a jump or making a lateral pivot while running. Osteoarthritis of the knee will develop in 50 percent to 100 percent of injured female athletes within one to two decades after knee injury. Several biomechanic and neuromuscular factors may be related to the increased incidence of knee injury in female athletes. Our findings—collected over the last two decades—indicate that valgus knee torques and neuromuscular control of the trunk predict ACL injury risk in female athletes with similar levels of sensitivity and specificity. These predictors may be linked, because lateral positioning of the trunk can create high valgus torques at the knee by both biomechanic and neuromuscular mechanisms. When a patient with an ACL injury is initially seen for evaluation in the clinic, the knee doctor may order X-rays to look for any possible fractures. He or she may also order a magnetic resonance imaging (MRI) scan to evaluate the ACL and to check for evidence of injury to other knee ligaments, meniscus cartilage, or articular cartilage.